I was part of the small group of people involved with the launch of Sheffield Eagles. We all had high hopes for the first game and the future of the club. Tickets, posters and flyers had been distributed, meetings were held and a supporters club was created. We were optimistic that, because of our efforts, there would be four or five thousand curious South Yorkshire people turn up to see the first game of professional rugby league to be played in Sheffield. As I am sure is the case with all new clubs, the first game is like stepping into the unknown﻿. 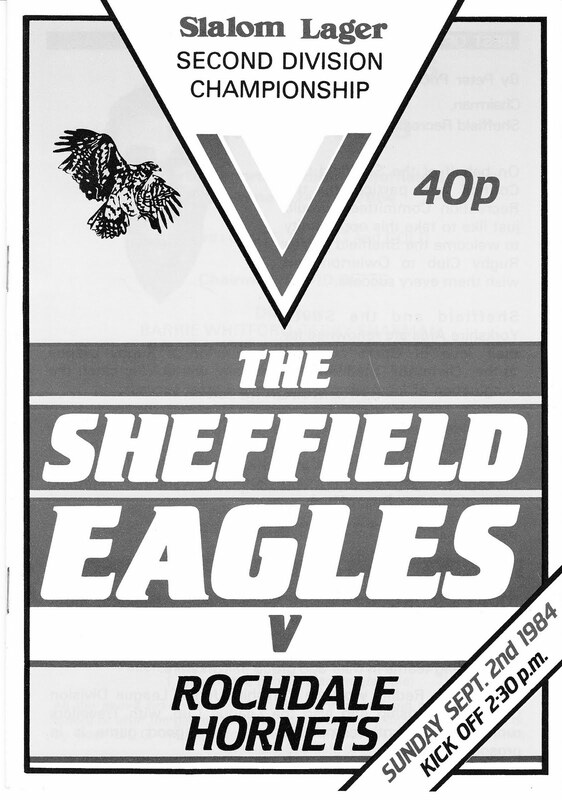 We had no real idea how a game between Sheffield Eagles and Rochdale Hornets would be received in soccer - mad Sheffield. Game day was very hectic. 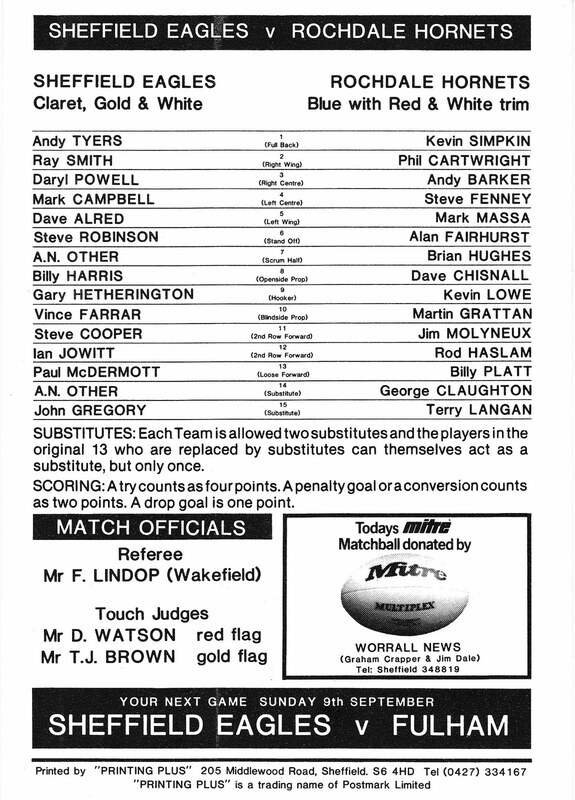 Very few people involved with the Eagles knew what to expect, and the Owlerton Stadium staff were more used to dealing with greyhound, speedway and stock car meetings, events that are very different to an 80 minute game of rugby league. Unfortunately, despite our hard work, the reality was that less than a thousand people paid to watch that first game. Giving an attendance figure to the media present caused me a dilemma. 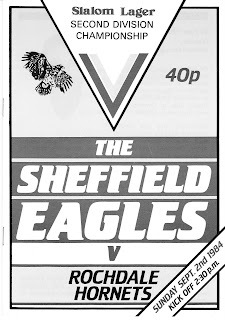 If I gave the actual attendance, the credibility of Sheffield Eagles would be damaged. Alternatively, if I gave a grossly inflated attendance figure, nobody present would believe it. In the end I decided to announce the attendance as 1,214, a figure that most people present seemed to find acceptable. Despite being told to do so, the security staff had not kept complimentary tickets and just waved people through the gate. I therefore had no real idea how many of the thousands of free tickets we distributed were actually used. The paying attendance certainly did not cover costs, but fortunately nobody questioned the attendance. In fact the Rugby Leaguer correspondent, who obviously did not hear the crowd figure announced, gave the attendance in their edition on 6th September 1984 as an impressive 2,000. I remember very little about what happened on the field in that first game as, apart from ten minutes after half time, I was too busy in the office to watch any of the action. One of my main jobs was fielding complaints about the DJ who had been hired to comment on the game. Unfortunately, he had little idea about rugby league, talked while the game was taking place, and also made comments more in keeping with American football than rugby league. The people who complained about the DJ left the ground muttering that if that man was at future games they wouldn't be. The DJ did not appear again but I am not sure that the people who complained returned either. Sheffield Eagles won that first League game by 29 points to 10 and during the rest of the season managed a further seven victories to give the club a final league position of fourth from bottom of the Second Division. Doncaster, Southend and Bridgend were the three clubs with fewer league points than the Eagles in the 1984/85 season.